This is for high pressure cleaning of sewer pipes, drain pipes, or municipal drains. It is available in long-length, continuous reels and comes with crimped-on male NPT solid ends. Its thick urethane cover is resistant to abrasion, punctures, tears, and friction - whereas more economical brands will break down prematurely. Its unique construction permits easy handling and high kink resistance. For the larger sizes, we also offer a BRUISER "Whip" hose (1" x 10ft – listed below) that can be attached to the end of the line in order to take the abuse typically applied to the first 10ft of line. 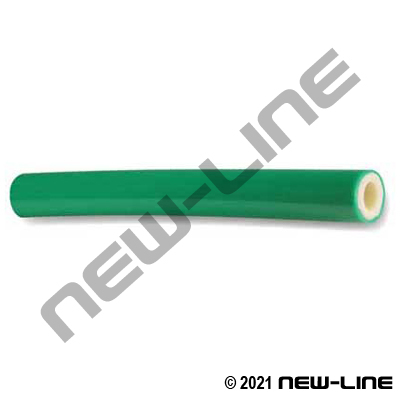 Construction: Tube: Smooth, thermoplastic elastomer blend. Cover: Smooth, abrasion resistant, 0.05" thick urethane (industries standard colours are orange for 2500 psi, blue for 3000 psi, and black for 1/2" 4000 psi). Reinforcement: One or two braids of high strength synthetic fiber.